Love at first sight the first bite taken with the eye - it's impossible to underestimate the importance of first impressions. That's why, for a successful reception, you need to create a dining venue that your guests will immediately feel pleased to be in. Elegant cutlery, sparkling glasses and a gorgeous centrepiece to draw the eye and start conversation will all go a long way towards creating a relaxed, buzzing atmosphere. Here's a bunch of tips to make every table the top table. 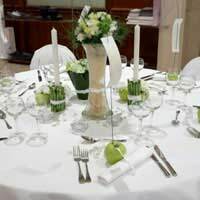 Your choice of table linen, china and glass will set a theme for the decoration in the rest of your venue. Go for formal elegance with classic white everything, or follow your colour scheme by picking coloured crockery, napkins and tablecloths.Coloured glassware's a decoration in itself when it catches the light, so make the most of the effect by picking different coloured glasses for wine and water. With tablecloths and napkins, however, you're better off sticking to a white cloth with coloured napkins, or using the same colour for both. The key is not to overdo the colour - any more than two in your decorating scheme and things will start to look garish. There's no limit to the number of ways you can arrange flowers, but be prudent when choosing blooms and shapes for centrepieces. They shouldn't be so tall that people can't see over, or so wide that you have to crane round to address your opposite number. Shallow bowls filled with flowers are easy for everyone to talk across, while single long-stemmed flowers in individual vases make a striking addition to contemporary tables. If you've got your heart set on flowers for the tables but are worried about your budget, consider artificial ones instead. These come in a huge number of varieties, and because the stems are already wired, they're easier to arrange than the real kind, so you can often do the work yourself and save money on the florist. Another cheap and cheerful option is pot plants, which can be bought in bulk to save even more. You can either mix candles into your floral arrangement, or use them on their own for a more modern look. Talk to your florist - they may be able to provide candles and containers to display them as well as flowers. There's almost as many ways to use candles as there are flowers. Try rings of straight-sided church candles in different sizes, support tall candles in bowls of glass nuggets, or scatter floating tea lights in bowls of water with a few flower petals. If you're using long, thin taper candles, make sure whatever's underneath them will be able to collect the wax drips so your table linen isn't ruined. Glass containers don't always have to be filled with flowers. Pack transparent vases with multi-coloured feathers, glass nuggets, or even fairy lights for an unusual centrepiece that'll get everybody talking. Take a leaf out of the Ritz's book and put finger food on old-fashioned silver cake stands. Neat little sandwiches, assorted biscuits or fairy cakes will look fabulous set out in layers, especially if you can ice the baked goods to match your colour scheme. If you've got a sweet tooth, indulge your guests with a display of confectionery. Fill a large glass jar with coloured boiled sweets, set out shallow bowls of sugared almonds, create a pyramid of chocolates, or stuff candy canes in a tall-sided vase. The diet-conscious can take the healthy route with bowls of bright, exotic fruit instead. Now's a good time to offer up your wedding favours. Use candelabra to hang small bags from, or arrange boxes in an artistic heap, so guests can simply help themselves to whatever goodies you've placed inside. If confetti's been banned at your wedding venue, add some to the reception tables instead. Sprinkle flower petals, feathers or metallic snippets, depending on the look you're trying to achieve, across cloths - but make sure none ends up on the plates!Blend practicality with style by making a big feature of your menu and place cards. Add embellished borders or elegant calligraphy to make them stand out. You can also use the cards as an ice-breaker by adding introductory sentences about each guest to the menu card, so everyone knows who's who and has something to talk about. Don't forget a wedding reception's supposed to be a party, so typical party accompaniments won't be at all out of place. Bubble-blowers, sparklers and party poppers are a great way to get guests in the mood for fun - but do remind them not to let anything fly during the speeches!